Surprise surprise, Alexa and I came up with another series of posts to collaborate on! Each season, we’ll share a list of our essentials. For Winter and Spring, it’ll be survival kits due to our mutual dislike of cold weather and we’re both plagued by allergies. For Summer and Fall, we haven’t thought of a name yet but I guarantee it’ll be less about survival since those are our two favorite seasons. But winter you guys. I am not a cold weather person. I don’t like commuting in the snow. I hate that when I leave the office it’s super dark outside. I miss wearing my ballet flats (and sundresses and tees). Clearly, I am just not a fan of winter even though December is my favorite time of the year (only because of Christmas!). 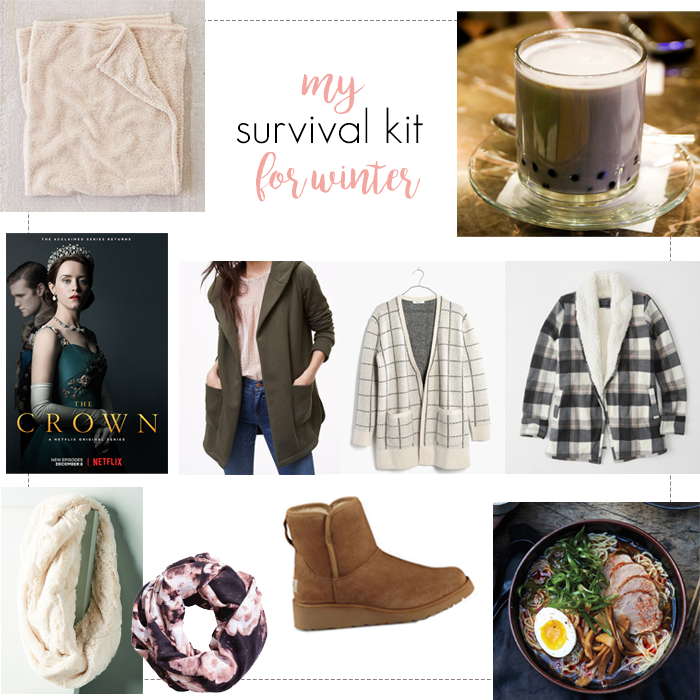 So Alexa and I wanted to share the things we absolutely need to get through the wintery months. Fleece throw blankets | I have one on my couch that was gifted to me and recently bought one for my bed. I love nothing more than to curl up under the blankets after a long day or in the morning when I want to sleep in a little longer. Hot taro bubble tea | I love taro bubble tea all year round but once the cold weather starts, I crave hot bubble tea constantly. It just hits the spot. Netflix | When it’s super cold and especially when it’s snowing, the last thing I want to do is go outside. Because of that, having TV shows to binge-watch is a must. I just started The Crown and I’m sure I’ll move onto another show as soon as I finish. Uggs | Uggs always get a bad rap but I really like the look of newer styles! The one I have is less bulky, has a slightly tapered toe and a bit of a wedge. It’s pretty much all I wear on the weekends. Ramen | I can’t think of a better time for ramen than winter. If there was one near my office, I’d probably go at least once a week for lunch. What would be in your winter survival kit? Don't forget to check out Alexa's post!